He may be scattered through the Doctor’s time-stream like confetti, but the Great Intelligence has only properly appeared in five (and a noggin) Doctor Who TV serials – plus one loose spin-off that didn’t feature the Time Lord at all. His adventures away from the telly box are pretty extensive, but if you’d like to learn more about the disembodied presence with a distinct love for snowmen, your best place to start is what you can watch, right? Except you can no longer watch the first appearance of the Intelligence. The Abominable Snowmen began on 30th September 1967, running to six episodes, but they were victim of the BBC’s junking policy. Of course, you can still enjoy the rest of The Abominable Snowmen, albeit in different formats: namely, audio recordings, including a soundtrack from the original airing plus narration, and as a Target novelisation. 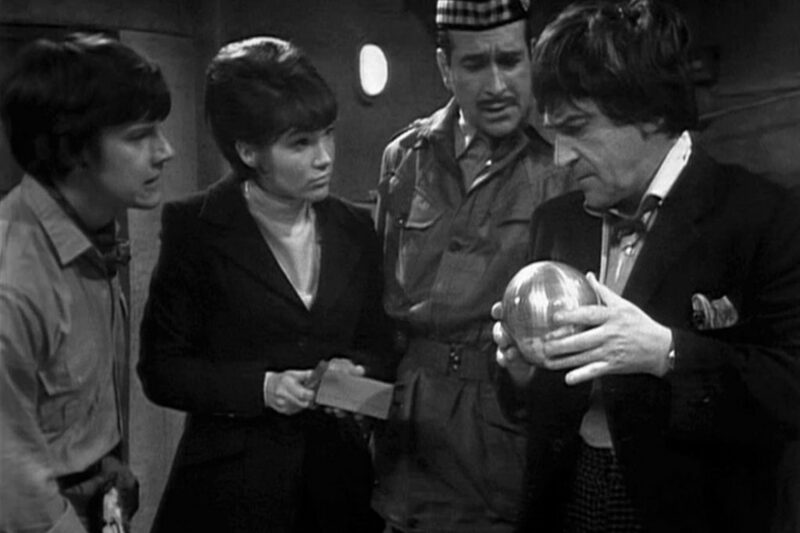 The Yeti are controlled by the Great Intelligence, who seems to already know the Doctor – because the alien presence’s timeline is a tad scrambled. But we’re forced to go forwards in a linear, chronological fashion, to the G.I.’s second appearance, another lost to time… at least for some 45 years. Only the first episode of The Web of Fear (1968) survived being wiped from the archives – until an announcement in 2013, that Parts Two, Four, Five, and Six had been found, alongside the entirety of The Enemy of the World (1968), in Nigeria. 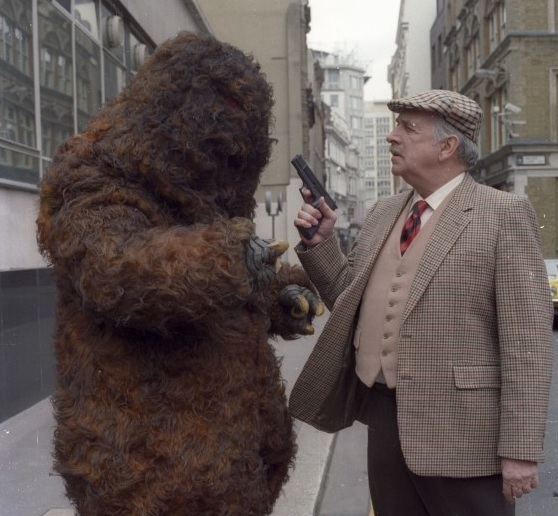 The Yeti returned, courtesy of Edward Travers (Jack Watling) bringing one back from Tibet to London; this time, the Intelligence largely succeeded as London was evacuated and his deadly web – or foam, if you insist – spread throughout the underground. But his biggest mistake was in ensnaring the TARDIS and drawing the Doctor into events. Sure enough, the Doctor and UNIT, led by one Colonel Alistair Gordon Lethbridge-Stewart (Nicholas Courtney), defeat the Intelligence, but not in the lasting way the Time Lord had hoped. The alien might not have returned in The Five Doctors (1983); then again, maybe he did. Who knows? 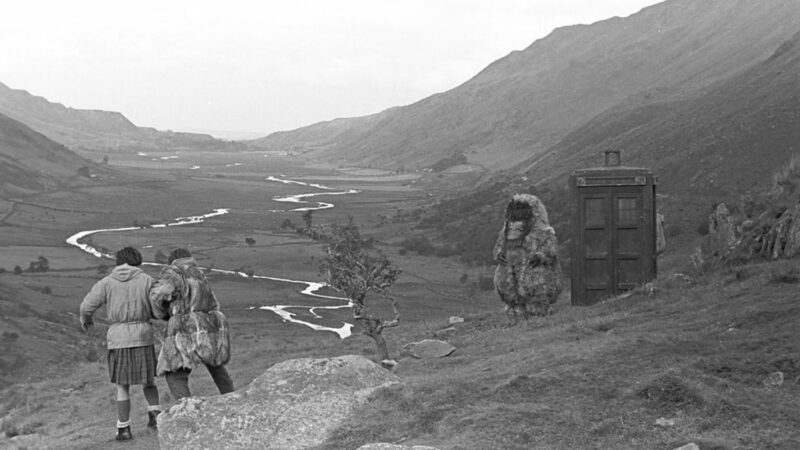 Either way, when the Second Doctor and Lethbridge-Stewart (now Brigadier) find themselves in the Death Zone of Gallifrey, they chance upon a Yeti, once again in rocky surroundings. This “snowman” was apparently left over from a previous game in the Death Zone, and was quickly buried… so is it just a robot, or was something controlling it…? Nonetheless, we wouldn’t see the Intelligence again until 2012 – ish. He would return in The Snowmen, but before that: Downtime. This was a straight-to-video spin-off, released in 1995, which saw a brief trip to Det Sen. Victoria Waterfield is drawn back there and finds Professor Travers, taken over by a very familiar presence. As an unofficial production during the so-called “Wilderness Years”, the Doctor doesn’t make even a cameo, but at least Deborah and Jack Watling, Nicholas Courtey, and Elisabeth Sladen (as Sarah Jane Smith) star. It’s also directed by Christopher Barry (The Power of the Daleks; The Brain of Morbius) and written by Marc Platt (Ghost Light), so might be a corner of the Doctor Who universe that you’ve yet to explore. Interestingly, in this short film, the G.I. tries to conquer the world using computers – a plan he would fall back on in the future. 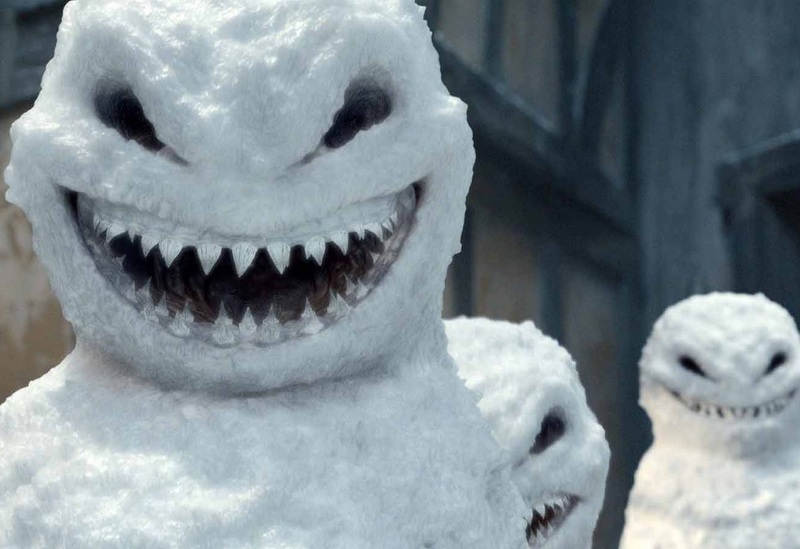 The Snowmen gave us something of an origin story for the creature: it’s originally a crystalline snow-like being (voiced by X-Men‘s Ian McKellan) with a low-level telepathic field, able to mimic, mirror, and remember. “Snowmen”, the Doctor tells us, “are rubbish in July”, so the G.I.’s plan was to evolve into a more humanoid form. In an effort to do so, however, the Intelligence accidentally loses corporeal form altogether. Oops. The Great Intelligence was back in Doctor Who after around 45 years, and he was clearly impatient. Because he then showed up in the very next episode, The Bells of Saint John (2013), played by Richard E. Grant, whose Doctor Walter Simeon had been effectively killed by the alien being in the aforementioned Christmas special. He revisits an old plan, attempting to take over the world using an advancement in technology: wi-fi! In a neat allegory of, perhaps, social media, exposure to internet connections can lead to manipulation, and the G.I. only fails when goading the Doctor by trying to claim Clara Oswald (Jenna Coleman) for his own. He really ought to know better. We’re forced to question when, in his life, this serial takes place – despite looking like Simeon, he recognises UNIT as “very old friends” of the Doctor’s, so The Web of Fear has happened in between The Snowmen and The Bells of Saint John, presumably. Is Walter’s visage that which he keeps falling back upon, and is this because he was likely the first human he made a connection to? He’s still ruthless with humanity, in contrast to the claims his representative, Miss Kizlet (Celia Imrie) makes about tending to his “flock” as if he were a farmer. 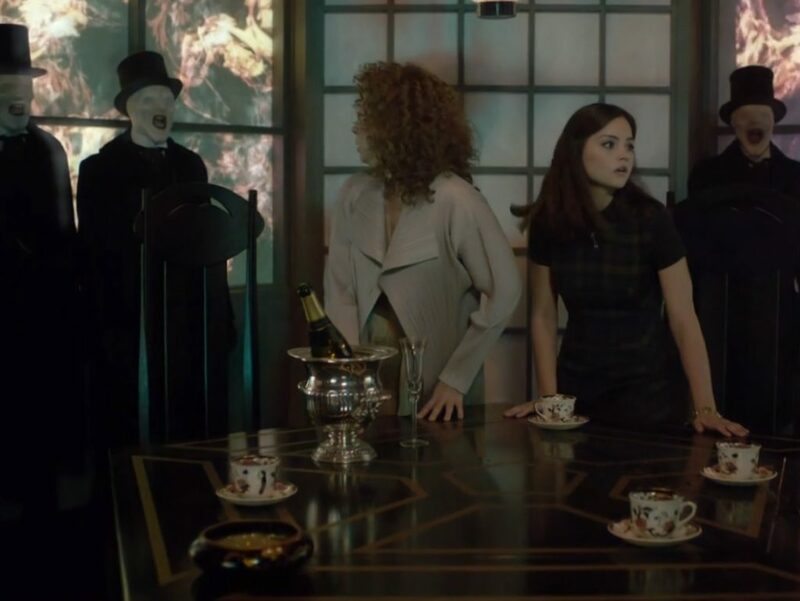 While the viewers learn what’s behind the sinister scheme, the Doctor neglects to find this out, instead focusing on securing a new companion. Priorities, eh? The most recent TV appearance of the Great Intelligence saw him actively trying to get his own back on the Doctor, luring him to Trenzalore, and gaining entry to the Time Lord’s tomb. How? 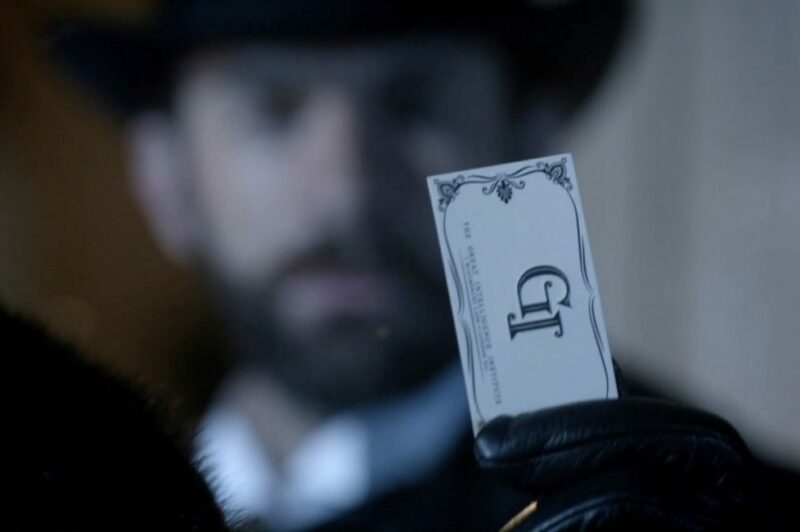 Access is granted when River Song (Alex Kingston) reveals The Name of the Doctor (2013). And that’s where the G.I. died. Maybe. Somehow, the Intelligence now has some form of physical form, albeit one that’s intangible and can be ripped to shreds. These are the poetic Whispermen, the features of whom can morph into those of Doctor Simeon. But that life has clearly gotten to him, and he willingly sacrifices himself in the hope of causing the Doctor pain everlasting. It’s an action that has to be countered, as star systems start to blink out of existence. And so that seemed to be it for the Intelligence. Except he’s not actually dead. What happens next is explored in Candy Jar Books’ novel, Lethbridge-Stewart: The Forgotten Son.